A filling is a way to restore a decayed tooth back to its normal shape and function. If you have a tooth that requires a filling, the dentist will first remove the decayed tooth material, then clean the affected area and fill the cleaned-out cavity with a filling material. 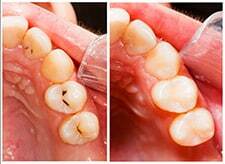 Fillings will help prevent further decay by closing off any cracks or spaces where bacteria might enter. Composite (plastic) resin fillings are custom-made to the exact color of the patient’s teeth, creating a more natural appearance. While these white fillings may be less noticeable than other materials, they can last 10+ years with proper dental hygiene and care. They may not be ideal for larger fillings as they may chip or wear over time. They can also become stained from coffee, tea or tobacco.